According to a review in the “Guangdong Province News,” Xiong Lijun is an outstanding example of the generation of artists born around the 1980s. 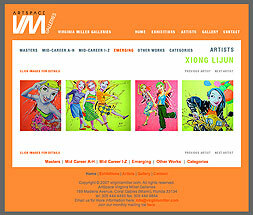 “Hoo Girl Girl Girl,” a 62-by-78-inch painting done in 2003, is typical of her work–three dancing young women, decked out in very trendy clothes and shoes, their orange hair contrasting sharply with water splashing across a lime-green background. “Her works express fresh visual images and a clearly individual artistic language, most obvious in her acute attunement with and masterful depiction of modern metropolitan youth culture,” the article states. Xiong Lijun’s inaugural important exhibition was in a satellite of the first Beijing Biennale, where she showed a gigantic triptych titled “I Enjoy, I Am.” Its subject matter, which she has continued to develop, was young people who exemplify infinite enthusiasm, energy and imagination, as well as boldness and independence of character. “She is obviously centered on the positivism of her own generation and its wholehearted enthusiasm for urban life and its consuming pleasures. Her work conveys a sense of personal and social liberation within a new metropolitan culture. In short, Xiong Lijun presents and celebrates new Chinese youth culture in bloom amid overall and continuing urbanization,” the unnamed reviewer continues.